Always searching in your cabinet for the right spice container? This cool product makes spotting the spice you need even easier. SpiceBands are like headbands for your spice containers! Put them around the edge of the lid so you don't have to pick up the jar and read the label. If you have to store your spices in a cabinet, I still recommend a tiered shelf for spices, like I use in my kitchen. The colors and clear printing on the SpiceBands also help with visibility. And for more ideas on spice organization, read my previous post on creative spice organization. Large kitchen cabinets are easy magnets for clutter. Items get lost in the back and it’s hard to see what you’ve got stored in there. 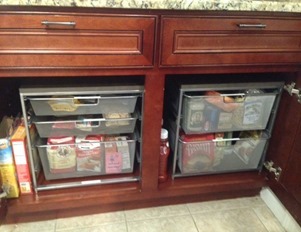 In my client’s kitchen, the base cabinet had to function as the pantry; there was no other space to store food items. It was a typical cabinet configuration with one shelf in the middle. Cereal boxes, canned goods and boxed items were jumbled and hard to retrieve. Often I try to use items clients already have in their house for storage, but sometimes there is the perfect product to solve a problem. In this case, the solution was a stand-alone elfa drawer unit from The Container Store. Designed specifically to fit in the cabinet, two of these drawer units filled the space, providing new storage and ease of access. We labeled the handles to know what category of food (baking, snacks, dinner) to store in each drawer. There was even space on one side for the tall cereal boxes. Perfect! The other option for this kind of cabinet is to install pull-out drawers. However, my client rents his home and couldn’t install any permanent solution in the cabinet. And when my client moves, he knows he can find another spot to use these stand-alone drawers. Not convinced about drawers? Read here for more on why I love drawers in kitchens. A simple pull-out drawer: that's all it took for my mom to be able to use her kitchen again. Last winter my mom, who is in her 70s, hurt her back, and getting pots and bowls out of her kitchen cabinets became nearly impossible. As she recovered, I helped re-organize her kitchen to make it easier to use. At one point she said "I wish there was a way to get to the way back of the shelf without having to get down on my hands and knees." I had no idea what she had to go through to find items in the back and lift out heavy pots. Right away I knew that adding simple pull-out drawers was the answer. I measured her cabinets and in one trip to the Container Store for these metal shelves , I had everything we needed. My husband and I easily installed the drawers in her cabinets, and they were ready to use. The drawers glide out effortlessly, so my mom can access what is in the back, without having to get down on the floor. Each drawer has a locking mechanism so when it is pushed back in, it stays in place. Pull-out drawers are made to solve the problem my mom faced in her kitchen. 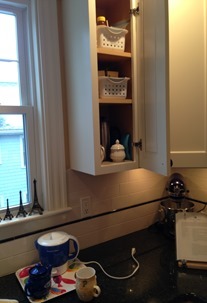 If you want to make your kitchen more functional (as I've written about before), consider adding pull-out drawers. Drawer options include the metal ones I used and bamboo drawers from The Container Store, or custom designed drawers from the company Shelf Genie. This article first appeared in the September/October 2014 edition of The Neat Sheet. Sign up to receive the Neat Sheet newsletter here! Have your fridge and pantry set up for easy lunch making. Here’s one idea for using clear bins in your fridge. I have a “snack” bin in our pantry; my daughter knows that she can select 1-2 items from the bin for her lunch. Also have your containers and wraps easily accessible in your kitchen. Here’s my organized food container drawer, which makes it easy to find what we need. Devise an easy “recipe” for school lunches. As I mentioned, we came up with a formula of 2 fruits, 1 veggie, 1-2 snack items + sandwich and a drink. Find a formula that works for your family. You may end up packing nearly the same thing every day and if your child likes it, great! Empty lunchboxes when kids get home from school each afternoon. There is nothing worse than opening a lunchbox or container and finding the smelly remnants of a previous meal. If lunch boxes get emptied and cleaned every day (have your kids do this!) they will be ready for filling that evening or the next day. Have your kids buy lunch at school. This plan saves many families, even if the kids buy lunch only 1-2 days a week. At my house I print out the monthly lunch calendar and my daughter looks ahead and circles the days she wants to buy lunch. Finally, don’t forget to get input from your kids on what they want for lunch. Sometimes my daughter has asked for surprising lunch items based on what she’s seen friends eat at school. What are your clever solutions for school lunches? Do you know what’s in your freezer? August is the time to get it cleaned out and organized. If you’ve been travelling a lot this summer, or just out having fun, you may have forgotten what’s sitting way in the back. And as an added bonus, when it’s hot outside you’ll appreciate a few minutes in the cold! To get started, read my blog post on organizing your freezer. If you have a second fridge or freezer in the basement, a professional organizer friend had a simple way to keep track of what’s inside: she uses a magnetic white board on the outside of the freezer and keeps a running list. You don’t even have to open the freezer to know that you have chicken and sausages inside. Here’s another option from my cousin Janna (organizer/photo stylist/maker-of-amazing linens): she keeps a freezer inventory in a three ring binder. Read more in her previous blog post here. Since I often get freebie magnetic boards I’m going to try out that idea and see how it works. “What do I do with my Tupperware®/food storage containers?” is one of the top questions I hear from clients when organizing their kitchen. And with Thanksgiving around the corner (= leftovers), I thought it would be appropriate to focus on the food storage container drawer in my kitchen for this month’s post in My Favorite Container series. Yes, a drawer can be a “container.” I’ve already highlighted my kitchen’s flatware organizer drawer…and another favorite part of my kitchen is the deep drawer where I keep my food storage containers. Store in a drawer. A drawer is the best spot for food storage containers. It’s so simple to open the drawer and then see what you have. (Much better than having stacks of containers tipping on cabinet shelves.) Just make sure you can easily access the drawer. Purge the containers you have. Do you really need stacks of leftover delivery containers? Do all your containers have a matching lid? Keep only the containers you use all the time. Find a kind you like, whether glass or plastic, and then if you need to buy some new ones, buy similar shaped containers. Squares stack and fit well in a drawer, but as you can see, I also have some round containers as well. Stack containers by shape. You can see my stacks of containers in the drawer. Makes it pretty easy to see what goes where. On the right side of the drawer are the smallest containers for my daughter’s lunch box. Corral the lids in one container. Then it’s easy to see what you have. Or use the kind of containers where thelids stick to the bottom. You can also use drawer dividersto section off the lids in the drawer. Wishing you many happy leftovers!